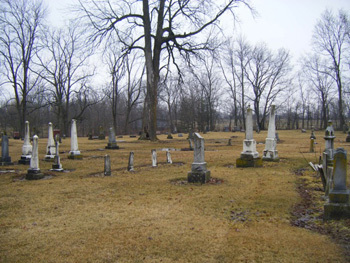 The Pleasant Mills Cemetery of Adams County, Indiana is a public cemetery is on the southwest side of US33 at Pleasant Mills, just east of SR101 in St. Mary's Township. The stones have been piled along a fence. The cemetery can be found by the following legal description: S28 T27N R15E. Its GPS coordinates are 40.775817° N 84.838617° W.
The data was contributed by Lynn Sewell, reformatted by Margie Roop Pearce, read and updated by Jim Cox and Penny L. Baughman North. It is used here with permission.